There are lots of exciting things that are happening in the New Year! Aside from the busy Christmas shopping season, Jim finished his Upper Deck trading cards and as soon as they are published in the U.S. we will be able to share some of them on our blog. A lot of you got to take a peek when he was working on them at our studio in the shop and that is always so cool to get your feedback. 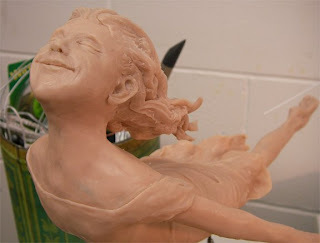 We are both still working on painting and sculpts for our show at The Lake House, opening on February 10th. 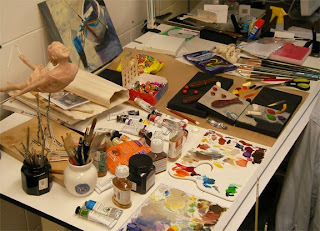 I am working on ten things at the same time as my ideas come more quickly than my execution! We are most excited about our New Web Site that will be officially launched (hopefully) at the end of January...although at the moment Thousands of you are finding it every day! There will be many cool surprises on there in addition to online purchasing. We will leave some surprises, but below is a peek at what the home page will look like. 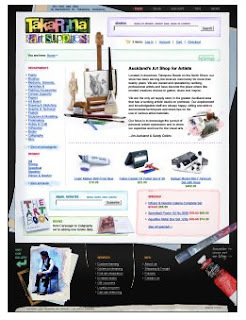 Our web designers are so talented and the best find since we purchased the shop back in 2006. Hope you all have a prosperous 2009, filled with creativity and fun. Happy New Year! Looking good. The sculpt is beautiful. Exciting times!